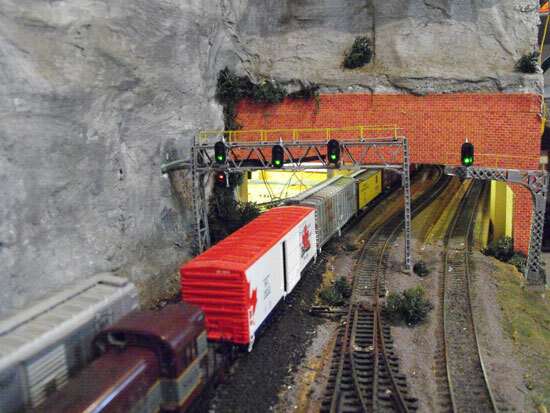 If you have been reading my other pages about my experimentation with adding signals to my HO model railroad, you'll know that I am using current transducers (CT) to detect the presence of locomotives and lighted cars. Essentially, CTs sense electrical current being drawn between the + and - rails to show track occupancy. The circuits were designed by Bill Hudson and I bought the unpopulated circuit boards from him.Bill had kindly redesigned the circuit for the use of the CTs I had bought and I, and fellow modeller Bill Payne, had made the physical changes to the boards. The instructions are on Bill's website at Hudson Telcom. The test section of four blocks was now working well. I extended the wiring about 20 feet and installed a new shelf for circuit boards and terminal strips to control track occupancy and signals for the four hidden tracks that connected Underhill South to Underhill North on my previous Utopia Northern HO model railroad. After getting everything wired, I found that I could get the red signal to illuminate when a locomotive entered a block, but the green signal would not go out. I was left with a red over green. These blocks had not been handshaked to blocks on either side so the yellow aspect was not in play yet. Once again the emails flew back and forth between Bill and me as he tried to diagnose the problem and find a solution. This led to some of his musings and experience with model railroad wiring, conductive ballast, track occupancy and other issues. I thought it might be helpful to other modellers who are struggling with installing their own wiring if I posted a summary of his emails. A lot of this applies to DC layouts as well as DCC. I chose the CT route to avoid interfering with track power. Problem: The green indication won't turn off when the red comes on. This is happening with a new signal installation on other blocks. Power is being supplied from the previous installation that works correctly. Possible Causes and Fixes: "A suggested fix: Reduce the CT sensitivity to the feed wire merely passing through the donut and see if the phenomenon still occurs. Then add one loop. Then a second.This will give you some indication of where the problem is coming from. At this point we need to determine where the detection threshold actually is. There may be a slight leakage somewhere. The red indication means the detection amplifier is trying to turn on but doesn't have quite enough current to set it solid. The output of the red amp needs to pull below its threshold to turn off the green. The whole point of the detection amp (CT) is to respond to minute current flows. We attempt to sense the idle current of a locomotive decoder, without the motor actually turning over. Hence the bridge resistor. The amp would "see" well under 10mA on the bench and that would set the signal a solid red. There was some flicker down in the micro-amp region. At the time, in the design phases, concern was to find a standing locomotive. In essence, detecting the slightest current flow. There is the trade-off. To detect a locomotive or caboose and yet reject the leakage of the installed track. If it happens in the same way in every block, it could be ballast glue. The operator of my beta site uses Elmer's (carpenter's) glue, thinned, for ballast. I use artist's "matte medium". The particular brands of both are good insulators, but brand to brand that may not be the case. The brand and type of ballast could also be an issue. I use foundry sand as part of my mixture. It adds a colour mix and some character to the ballast. It is also slightly conductive. Therefore restricted to "dark territory." Since I primarily operate analogue locomotives it really isn't that much of a problem for me. I usually make rail gaps by cutting the rail with a Dremel and a red wheel. Then fill the gap with epoxy, shaping and dressing it when it cures. There are some brands of epoxy that are semi-conductive, over time. Enough so that an insulated joint will carry enough current to creep an efficient locomotive. As an aid to that determination, perhaps a resistor such as you use for a caboose (300-400 ohms) across the rails in each block. That should set a red signal solid. Lifting the resistor should then revert the signal to green. Just as though you were commissioning a new system. It won't necessarily be the ultimate test, but should give an indication of just how sensitive the installation is on a block by block basis. The CT amp was developed specifically for your requirements. Most of my users with DCC use the Twin-T circuit, some with relays, some without. Most of the rest use photocells and room lights for detection. That's where I picked up on the ballast leakage business. There are only a couple other installations with the CT circuit and quite honestly I haven't spoken with them recently. Both run DigiTrax controls. A rat's nest of wiring can act like an antenna! Something else to consider: When I first tackled DigiTrax, I was getting interference not from the track power circuits but from the LocoNet cables. The layout was (and still is) wired for four main cabs plus local control in the fifth position. The DigiTrax power supplies merely replaced two of the analogue supplies. So, the underside of the layout is an enormous antenna web with the individual power leads. I spent weeks trying to eliminate non-existent interference from the wiring. It turned out the LocoNet (high speed networking) cables lay parallel and close to several track feeders. There was enough capacitive coupling to turn on the detection amp yet low enough the green wasn't turned off. Similar to what you describe. If you are using such a network there might be sufficient coupling to cause a problem.I would try rerouting the network cable and see what happens. Or just unplugging cables to the remotes long enough to test things. I do recall you telling me you had several different power systems. [I use Lenz at home and we use DigiTrax at our NMR club.] I remember DigiTrax and Lenz specifically. Not sure if that would be an issue, but something to consider. The original signal system was using Twin-T and we ended up adding relays. Once I pinned LocoNet down as the trouble, the relays were never removed so I can't say for sure where the threshold actually is for that problem. I did find some interesting wire at Home Depot. The cable is for sprinkler systems and has low voltage insulation. They are proud of it at $1.00 a foot, but... ten(10) conductors makes it 10 cents a foot per. Certainly cheaper than Radio Shack hook up wire. Standard 10 colour code, like resistors. One of each. Size is AWG-18, solid. A little heavy for track leads but good for feeders and auxilliary circuits. Now, there's "Bell" wire, as in Bell Systems. Telephone wire. I use it for signal stuff and other low current installations. AWG-24 if it's actual Bell, AWG-26 if it's generic telephone wire. Colour code is usually as pairs, so useful for isolating groupings. Except station wire, which is perfect for signalling; red, yellow, green, and black. Networking cable (installed plant) is usually AWG-26 or AWG-28. Colour coding is nominally the same as the communications code; blue, orange, green, brown, slate, white, &c. (1-6) Normally paired with white, so an 8 conductor cable would be blue, orange, green, and brown; paired with a corresponding white on each one. AWG-14 for primary feeders is what I would call "over-kill". But, with house wiring so readily available, I often recommend it simply for the price. As with the smaller sizes, the solid copper makes dressing bundles easier. And certainly it is easier to tighten under a screw head. Kinda tough if it has to go around corners (or in conduit), but otherwise my preference. AWG-18 would suit as primary feeders for all but the largest installations. It's good for 8-10 amps before it even begins to get warm. Probably carry 15-20 before it gets hot enough to raise a blister. The big issue is the number of passes that will fit through a CT.
What I'm trying to do is think through the high frequency of the detection circuits as I write. The most glaring difference to me is the length of the twisted pairs from the donuts to the board. Me, I would look there first. No specific reason, just it glares in my face that detail. Call it instinctual... . It may be possible to relocate the twisted pairs but at the frequencies involved, twist rate can make a difference too. It just feels right, look there first. Many "old farts" put down scenery before laying track and use wire screen as a form. Cork is only 6mm, less than a quarter inch. Don't laugh, I've actually seen the older longer spikes get into the wire screen. [This happened to me when using some O gauge spikes with code 100 rail on a previous layout]. Homasote is a half-inch thick and is dense enough to hold spikes [that's why I prefer it]. And yes, many adhesives are mildly conductive, including some brands of ACC. The computer supply you are using [I took it from an old PC] has enormous filters designed to reject noise. I wouldn't worry too much there unless nothing else pans out." There endeth the emails thus far. As of now (September, 2011) I hadn't solved the problem. I just tell my operators if they see a red the block is in use and disregard the green for now. I'm confident I'll get it figured out and have ordered more circuit boards from Bill so I can wire the adjacent blocks. I also found an article on how to scratchbuild a signal bridge in the December, 1979 issue of Model Railroader magazine. Yes, I still had magazines going back to the 1950s! I bought the metal supplies from Special Shapes in 1980 and found them under my benchwork in a mailing tube. I never had the courage to scratchbuild a metal signal bridge. I gave it a try because I had to retrofit signals to track that was already in place and there wasn't much clearance. A final thought. As with building benchwork, it's a good idea to plan ahead for signals and other model railroad wiring. Not that many of us are that smart. At my age crawling around under the benchwork is a pain, literally. Also, if you noticed the two-light signals hanging down on the bridges in the photos, these are used for turnouts and are wired directly to relays I installed when I put in the solenoid switch machines. I used the auxiliary contacts to power the relays which allowed me to install frog wiring and plan ahead for future uses. I was thinking of signals but never got around to it. These signals bypass the circuit boards. The red indication at Underhill South shows that the branch to the hidden reverse loop is set against the mainline inside the tunnel. At some point this can be wired to the boards so that the block will also show red, not for track occupancy but for a turnout set against the mainline. More to come as I move forward... . In 2015 my friend John Houghton designed CT track occupancy boards that operate on 5 volts. They are really neat and very sensitive. I will be installing them on my new UNRR. Go from "track-occupancy" to DCC detectors. Go from "track-occupancy" to Signal construction. Return from "track-occupancy" to my Home Page.